Bring the entire family for this special event that shall become a tradition! North Pole Village at Snow Fest captures all the holiday spirit and places it at one event. You will enjoy an outdoor market featuring holiday arts & crafts, food, treats, and beverages including hot chocolate. Best of all, you will be captivated by a stroll down Main Street at the North Pole Village lit up with holiday lights. Listen to holiday music, smell the fresh cookies baking, and stop by Santa’s House for pictures and to provide a list of all your holiday gift dreams. At 6:00 pm, join the Mayor and Santa Claus for the annual lighting of the Cathedral City Holiday Tree in front of City Hall. Stay to listen local choirs sing, take a picture of Santa Claus with the kids, and wander through Town Square Park that will be transformed into a winter wonderland. 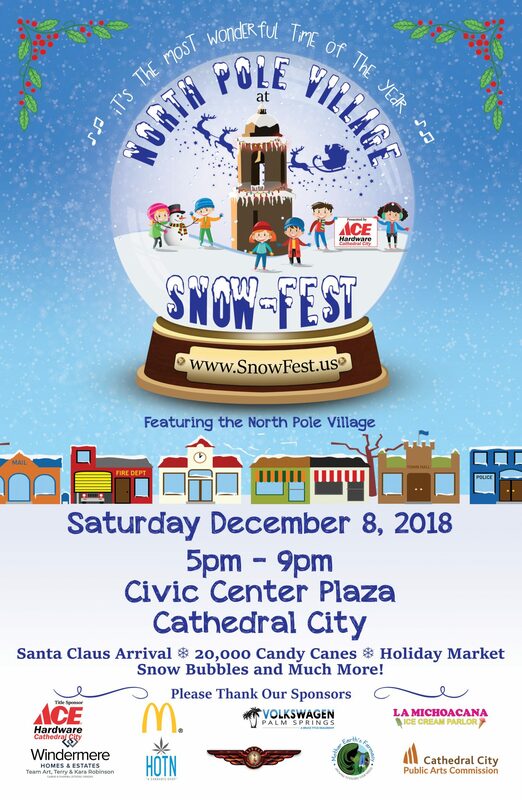 Pick up free passes at the Information Booth to go to Desert Ice Castle (limited to 300 passes) for a free ice skating event on Tuesday, December 11, 2018. Free Admission. Free parking in the City’s Downtown Parking Garage.